Some exciting news on the 2017 Aluminum Wrangler has emerged after reports that the next generation of the iconic Jeep may not only switch to a unibody platform but may also be relocated away from its historic assembly plant. 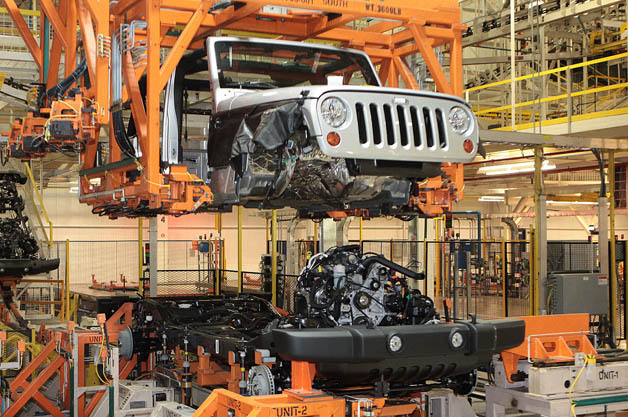 Putting many fears to rest, Automotive News is reporting that the shift to aluminum construction may not necessarily mean the next generation of the Wrangler is ruined. The story elaborates on the challenges presented by the necessary shift to aluminum construction: the Toledo assembly plant does not have aluminum tooling, and it is already operating well beyond its intended production capacity, so the time and expense required to replace the steel manufacturing equipment with that for aluminum is prohibitive. Most automotive bean-counters would simply redesign the next Wrangler to use an aluminum unibody produced in one of Fiat-Chrysler's other, underutilized assembly plants. Thankfully, it seems that Fiat-Chrysler's CEO Sergio Marcchione realizes the value of the Wrangler's iconic capability and durability to the brand. After all, Wrangler production simply can't keep up with demand, and sales of every other Jeep vehicle (no matter how limited their offroad capabilities) benefit from the Wrangler's priceless reputation. It is absolutely critical that Jeep preserves the Wrangler's Jeep-ness, so Toledo's mayor D. Michael Collins and Ohio's governor John Kasich made a stern conference call earlier this month with Marchionne and arranged a face-to-face meeting. Details have not yet been revealed, but the discussions must have been a success because only twelve days after that meeting, Toledo’s city council agreed to spend $9.4 million to purchase more than 32 acres of land directly west of the Wrangler factory for its possible expansion. Aluminum construction can be a real benefit to the Wrangler's capabilities, but only if it is used in conjunction with a heavy-duty ladder frame and the requisite pair of solid axles. Regarding this latest development, Jeep spokesman Todd Goyer declined to comment on the next Wrangler. However, he insisted that the next generation Wrangler “will be the most capable Wrangler ever.” We're all hoping this is true.